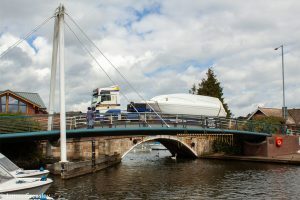 Holidaymakers and locals alike were treated to an unusual site yesterday – the hulls of our two new holiday cruisers being delivered to us on the back of a wide load lorry with the unusual delivery looking particularly impressive as the lorry crossed Wroxham Bridge! 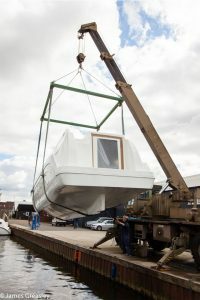 Our boatbuilders will now start work on fitting out the all new Premier cruisers, which will sleep two people, in time for the start of the 2019 season. Better still we are throwing down the gauntlet for you to name the new class of cruiser! Wroxham Bridge is the second lowest bridge on the Broads! So this is the first and only time our new boats will cross over or under the bridge! Simply email us your suggestion to info@broads.co.uk remembering that all our boats names start with the word “Fair” in recognition of our Faircraft Loynes fleet. All suggestions need to be submitted by Thursday 31 May 2018. Please remember to leave your contact details so we can let you know if you have had the honour of naming our cruiser! Watch this space for regular updates on the boat building project. 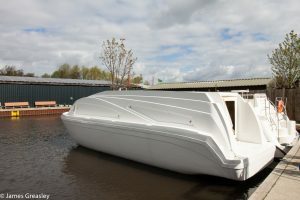 And watch out for the new models joining our Broads boat hire fleet in 2019.